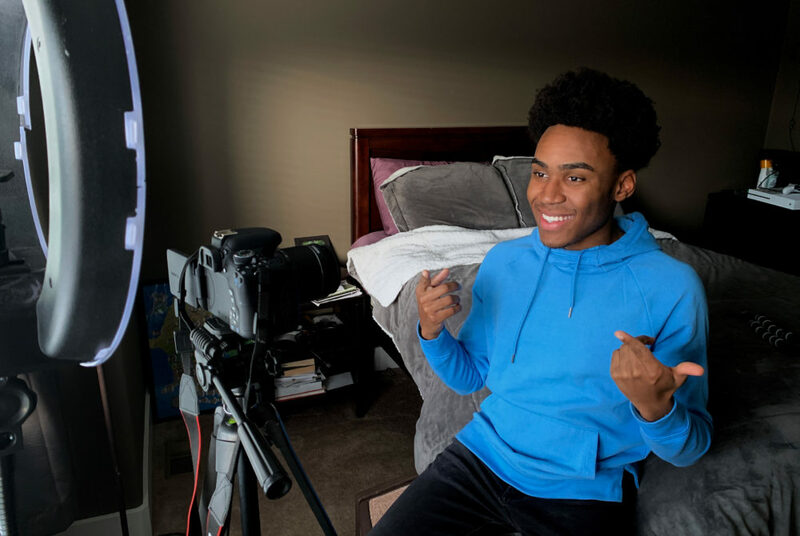 Rumi Robinson, a freshman majoring in biology, started a YouTube channel called “imuRgency” two years ago to post weekly videos about his college application experience. When students decide what college to attend, they typically read reviews online, go on campus tours and weigh financial aid packages. But Rumi Robinson, a freshman majoring in biology, hopes high school seniors turn to YouTube. Robinson started a YouTube channel called “imuRgency” two years ago to post weekly videos about his college application experience and said he never expected it to grow into a platform that drove people to attend GW. But during his first few days in Foggy Bottom last semester, a student from his Colonial Inauguration group told Robinson that his videos about applying to GW helped him pick the school. Now that he is officially a student, Robinson publishes a video every Sunday about his college experience. Robinson’s channel has garnered more than 5,000 subscribers and now focuses solely on various aspects of attending GW. He has taken viewers on a tour of his residence hall room and created videos about what a typical week at GW is like, recording everything from registering for classes and studying in Gelman Library to trying food trucks and exploring the District. When Robinson started the channel in high school, his videos didn’t have a clear focus and he would post miscellaneous videos like the “chubby bunny challenge” and humorous advice videos like “a freshman’s guide to high school.” But Robinson said his channel gained traction when he started making videos about applying to college and sharing his personal experience. Despite being part of a “small corner” of the internet, Robinson said interactions like the one he had with his former CI group member have shown him the impact of his videos. “I would always see the views come in on my videos, but I’d never truly understood that those are all real people with real lives and goals until then,” he said. The video host said he decided to focus his content on GW because when he was looking for videos about the various colleges he was applying to, he couldn’t find posts with more information about the schools to help him make his decision. Now he hopes that his channel is a resource to other prospective students, he said. While creating videos about his time at GW, Robinson said at times it has been difficult to balance being a student and being a YouTube videographer. The process of making a video takes about 10 hours, Robinson said, between brainstorming video ideas, shooting footage with his phone and editing the content to upload. Since he arrived in Foggy Bottom in the fall, Robinson said feedback has been overwhelmingly positive from his friends and subscribers, with mostly support and excitement. In the comment section on his page, Robinson often receives messages from students complimenting his channel and prospective students who turn to his channel for advice and a glimpse into life at GW.